From box CP/CENT/CULT/01. File 01: NCC minutes (incomplete) and papers incl. report on Writers Group. | File 02: Papers, incl. agendas and circulars. | File 03: Reports to CP's Commission on the Middle Classes on writers, architects, teachers, artists, actors, journalists and the legal profession. 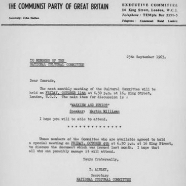 | File 04: NCC minutes, etc., 1958-63. | File 05: NCC minutes, etc., 1962. | File 06: NCC minutes, etc., 1963. | File 07: NCC minutes, etc., 1964. | File 08: NCC minutes, etc., 1965. | File 09: NCC minutes, etc., 1966. | File 10: NCC minutes, etc., 1967. | File 11: NCC minutes, etc., 1968. | File 12: NCC minutes, etc., 1969. | File 13: NCC minutes, etc., 1970. From box CP/CENT/CULT/02. File 01: NCC minutes, etc., 1971. | File 02: NCC minutes, etc., 1972. | File 03: NCC minutes, etc., 1973. | File 04: NCC minutes, etc., 1974. | File 05: NCC minutes, etc., 1975-1976. CP/CENT/CULT/01/01: NCC minutes (incomplete) and papers, incl. report on Writers Group; Proposals by Jack Lindsay for a union of intellectuals; report on Our Time; statements on the Arts Council, the British Theatre Conference, Communist policy for the theatre. The worthwhile use of leisure time, the CP Writers Group and the Modern quarterly. CP/CENT/CULT/01/02: List of committee members; correspondence of NCC chairman, Emile Burns, and secretary Sam Aaronovitch; report of discussion of work of district cultural committees 6 July 1954; notes of Burns for Historians Group meeting on ideological work May 1955; notes of Artists Group on place of culture in British Road to Socialism for NCC meeting 9 November 1956; report of NCC discussion of book 'Declaration', by Doris Lessing, Colin Wilson, John Wain, Kenneth Tynan et al, 13 December 1957; TS report of national literature conference 26 May 1959. CP/CENT/CULT/01/05: NCC minutes, agendas, circulars, etc. CP/CENT/CULT/01/06: NCC minutes, agendas, circulars, etc. CP/CENT/CULT/01/07: NCC minutes, agendas, circulars, etc. incl. draft statement 'The Communist Party and science', February 1964; TS lecture 'Shakespeare and history' by Arnold Kettle. CP/CENT/CULT/01/08: NCC minutes, agendas, circulars, etc. CP/CENT/CULT/01/09: NCC minutes, agendas, circulars, etc. CP/CENT/CULT/01/10: NCC minutes, agendas, circulars, etc. incl. draft statement 'Questions of Culture and Ideology' January 1967.